New folding bikes are introduced every year, but it is rare to see a new folding method that is different from previous designs. There are two main types of folding methods that are popular, which I will call the Dahon method and the Brompton method. The Dahon folding method has a hinge in the middle of the main frame, plus a folding handlepost. Most folding bikes use this method, as it is simple and straightforward. However, it is not the most compact method. Another type is the Brompton method, where the rear triangle swings below the main frame, while the front half of the frame is folded. A variation of this is seen on the Birdy folding bike and the Tyrell folding bike, where the front fork folds and tucks the front wheel inwards. This method is quite compact, but a chain tensioner or chain keeper is needed to prevent the chain from dropping off during folding. This new Java Neo 2 folding bike uses a hybrid of these folding methods, plus some new ideas, to create a really unique folding design. The first generation is actually the Java Neo, which is the carbon frame version of this folding bike. The Java Neo 2 is the aluminium frame version which is cheaper and also heavier. The stock components on the carbon Neo and the aluminium Neo 2 are also different, to meet different price points. On the carbon Neo, the stock drivetrain is 1x11 speed, while the Neo 2 has a 1x9 speed drivetrain. Most other components such as brakes and crankset are also different. As for the price, the aluminium Neo 2 costs just 40% of the original carbon Neo. Before we look at the innovative new folding method, let's take a look at the stock setup of the 1x9 speed Java Neo 2. Java Neo 2 folding bike, with a nice looking frame shape. I'm not a big fan of the colour schemes though. Neo 2 model name indicated on the main frame (top tube). The paint finish quality is quite good. Flat handlebar setup (540mm wide), with a Deca aluminium handlebar and OEM lock on grips. Top of handlepost has a quick release clamp which is the same design as a Dahon/Fnhon handlepost. Shimano Altus SL-M2000 9 speed MTB shifter, with OEM brake levers. Other than the top clamp, the height of the handlepost is also adjustable. I don't like this as it tends to rotate even when the lever is adjusted to clamp very tightly, plus it adds unnecessary weight. Handlepost clamp, somewhat similar to older Dahon handleposts or the Tern handlepost. Looks bulky but works well. Java logo found on the head tube. Large welds on the aluminium fork is unsightly, after I am used to the smooth finish on the Dahon MuSP. This locking lever plus safety catch on the main frame looks very good. It is nicely integrated into the frame, with a little switch to act as a safety latch to prevent accidental opening of the lever. Note that this switch is not found on the carbon Java Neo. Hinge near the front of the main frame, similar in position to the Brompton. Once again, good paint quality can be seen here. Although the paint quality is good, the welds are not polished, giving a very rough and cheap appearance. A little bit of internal cable routing here, with the rear shifter and brake cables entering the main frame, and exiting just in front of the bottom bracket area. Cables exit here, and go to either side of the seat tube. 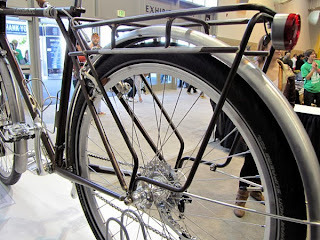 There must be sufficient cable slack in order for the rear triangle to fold without being overstretched. Also, the rear triangle pivots around the centre of the bottom bracket, meaning that chainstay length is always constant. On the left side, the rear triangle is tightened into the central bottom bracket unit, using the black part which can be turned using a pin spanner. Not too sure how a Hollowtech II bottom bracket will be fitted as space is limited. Drivetrain as seen from the right side. Crankset comes with a 52T chainring that is removable, with an integrated chainguard. Square taper type of bottom bracket, with a square taper crankset. Simple and works well but is rather heavy compared to Hollowtech II type. Sora RD-R3000 9 speed rear derailleur, with an unknown 11-28T 9 speed cassette and KMC chain. Front wheel has a high profile aluminium rim (estimated to be 40mm tall), 24 spokes, with a 160mm 6 bolt disc brake rotor. 100mm front OLD, with quick release axles and a mechanical disc brake caliper. Brake caliper mounting requires an adapter to convert the IS mount to Post Mount type. The front fork has eyelets which I presume is for front mudguard mounting. Rear brake caliper mounting is of the Post Mount type, but an adapter is still required. 135mm rear OLD, with a similar 160mm 6 bolt rotor. Rear wheel also has a spoke count of 24, and uses the same mechanical disc brake caliper. Stock CST tires have a dimension of 40-406, which is quite wide. The rated PSI on the tire is only 35-45 PSI! Deca branded OEM saddle which is of decent quality. Attaches to the seatpost with a clamp design that is similar to Litepro seatposts. 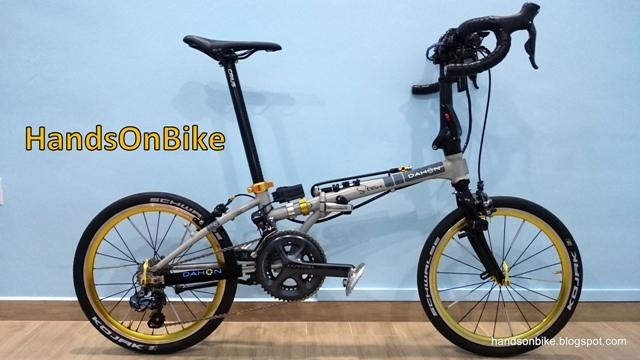 In the second part of the introduction, I will share more regarding the folding mechanism and method for this Java Neo 2 folding bike. We shall see what is special about the new folding method and mechanism that makes it unique! Seems a shame not to add some sort of rear suspension like the Birdy bicycle if you are going to go through all the trouble to have the rear triangle fold too.